Above ground operations require a highly-available wireless network, easily deployable, robust to endure harsh conditions and adjustable to changing network conditions, considering the mobility of equipment and the landscape design. To enable reliable communications for efficient production, safety, site security and remote connections, ACKSYS offers a Mesh wireless network approach with rugged & versatile WiFi devices. The Mesh network topology is characterized by its ability to allow any node in the network to communicate directly with any other node in the network. 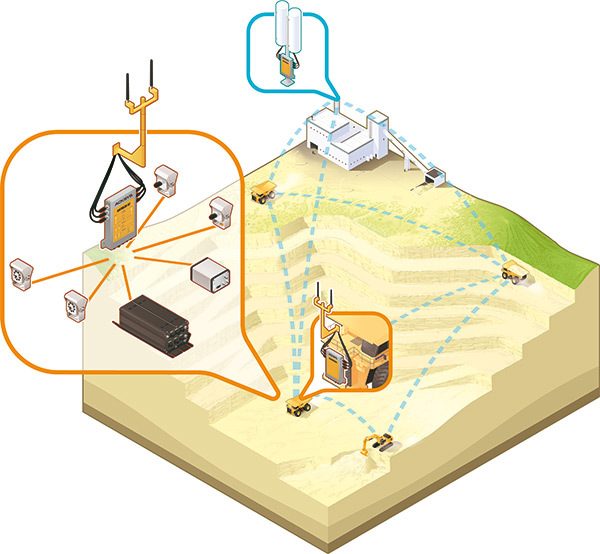 A mining equipment’s signal can then take multiple paths to reach the intended receiver. Moreover, if one node fails, others can take over. With self-forming Mesh topology, ACKSYS’ devices provide a robust, scalable, and resilient broadband network connectivity.